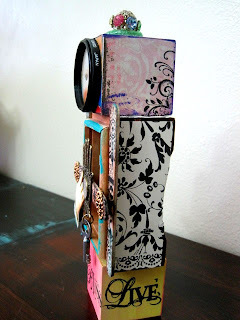 The challenge this week at Inspiration Avenue is "PAPER DOLLS". 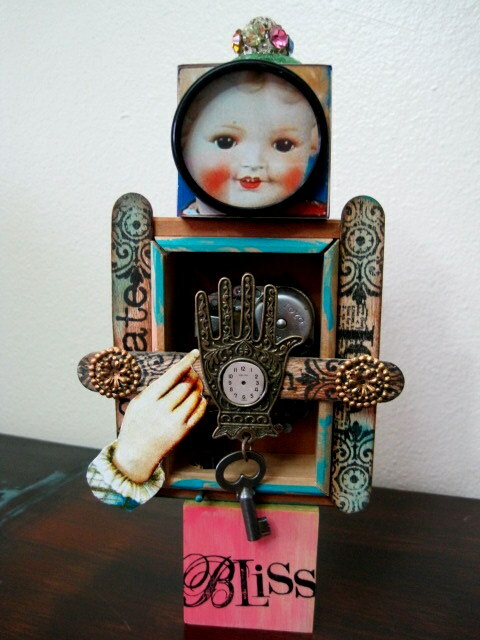 I didn't actually make this Doll Assemblage for this week's challenge, for lack of time this week, but she was just recently made and I feel like she would fit well for the challenge. She started out as a paper doll and I ended up only using her face. I never know what I am going to do until all my supplies are set out in front of me and then she just evolved into this MUSIC DOLL ASSEMBLAGE. 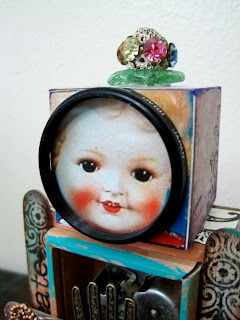 She is made from Vintage Jewelry parts, stamped and stained blocks, Vintage music box (which plays beautifully),some stamped tongue depressor sticks from fellow artist Lani Kent (Healing Expressions), vintage camera lens,and brass embellishments. She was so fun to make. 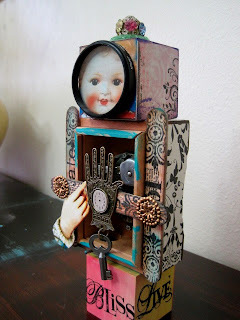 I have other Music Doll Assemblages in my Etsy shop and I am currently finishing up another one for Valentines Day, soon to be in my shop. I would love for you to stop by and take a peek soon. Thank you for stopping in and be sure to check out all the "Beautiful Dolls" at Inspiration Avenue. Roll over the title of this post and it will take you there! You are welcome to join in on the weekly challenges and you might find a spot on the Red Carpet! See you there! You are just so talented at putting it all together. I clicked on the pictures so I could see every yummy detail. I love that hand charm. What an adorable face! I love how you put these things together to create a piece like this. It's cool and quirky! I suspect you must be ineligible for the Red Carpet prize, because this is the BEST entry this week. Although the winner's was awesome, I'm an assemblage kind of gal who loves it when widgets go flawlessly and beautifully into wadgets. 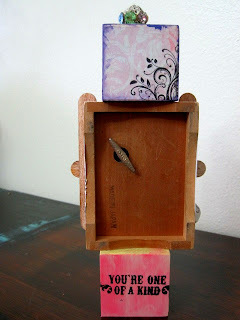 LOVE THIS PIECE!! fantastic Kim!! i esp love what you did with the hand on her torso! wow! this is sooo beautiful. I love your assemblages! She is fabulous, Kim!! I love her cheerfulness. Great colors and patterns. Hope you are doing well and off to a wonderful start in the New Year! !